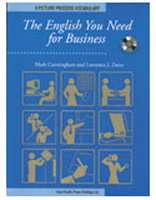 The English You Need for Business is an active and verb-rich picture process dictionary, introducing vocabulary essential for anyone in business, using a lively and flexible presentation. Process-related vocabulary listed alphabetically according to verbs, nouns, and others. Key usage and grammar points pertaining to the processes in the chapter are also included.